The government of Oyo State has formally signed the release of funds to IITA for the development of a 20-year agricultural policy roadmap. This signaled the immediate start of the development of the framework, which is a collaboration between IITA, Nigerian Institute of Social and Economic Research (NISER), and the Oyo State Ministry of Agriculture, Natural Resources, and Rural Development. 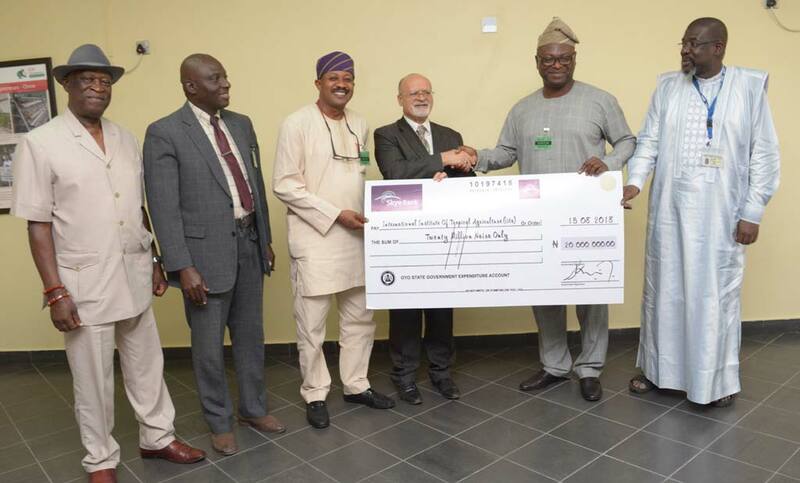 The official check handover ceremony was held at IITA in Ibadan on 15 August and attended by a delegation from the Oyo State government led by the Honorable Commissioner of Agriculture, Natural Resources, and Rural Development, Prince Oyewole Oyewumi; the Permanent Secretary of the Ministry, Victor Atilola; and the Special Adviser on Agriculture to the Governor of Oyo State, Prof Oluwasegun Adekunle. DDG-P4D Kenton Dashiell (center) receiving one of the checks from Honorable. IITA Senior Agricultural Economist Tahirou Abdoulaye gave an overview of the processes that led to the development of the framework, which originated with a request for support from Oyo State Governor Abiola Isiaka Ajimobi to IITA Director General Nteranya Sanginga. From this, various conversations have taken place over several months, culminating in the invitation to both IITA and NISER to collaborate on developing the framework. IITA Director of Development and Delivery, Alfred Dixon, gave a breakdown of the second component of the Oyo State agricultural transformation—the development of the agroindustrial park. He said the park will attract private sector investment, which will improve the agricultural system in Oyo State, create jobs for the populace of the State, and alleviate poverty. “With the funding now available, we are getting into the field immediately to commence the soil and land survey and suitability assessment,” he said. Prof Adekunle expressed delight at the unfolding development. He described the framework document as the first of its kind in Nigeria and lauded Oyo State for living up to its moniker as The Pacesetter by being the first state to collaborate with IITA and NISER to develop an agricultural roadmap. Group photo of attendees at the funds release ceremony.